It was a gutsy, free-slugging prizefight, the kind of game that no team deserved to lose. But Texas wanted it a little more and came away with a 47-40 overtime win against the West Virginia Mountaineers in Morgantown. The winning touchdown was a two-yard pass to fullback Alex De La Torre, his first catch in college, but it took a defensive stop by linebacker Steve Edmond, who tipped away a sure touchdown on third down and intercepted the pass on fourth down, to seal the victory. No play was bigger than fourth and six from the WV 46 yard line, with under a minute to play, when the blessed tandem of Case McCoy and Jaxon Shipley hooked up on an 8-yard completion. McCoy’s inability to convert on third downs- he was one for his first 10 tries- kept Texas behind for most of the game, but in the second half he was Clutch City. They love John Denver’s “Country Roads” up there in WV, but the song of the night was this: “Case McCoy, take us home/ To the place we belong/ West Virginia, mountin’ drama/ Case McCoy, take us home.” His numbers on the night, 27-49 for 283 yards, three touchdowns and one interception, were nothing special because they don’t measure his heart. The kid just wins. He’s gone from loser to legend. It was exhausting, exhilarating to watch these two foes go toe to toe, but seemed only right when a 24-yard field goal by Anthony Fera, his fourth of the night, sent the game into overtime at 40-40. Mike Davis scored on a 49-yard bomb in the third quarter to pull Texas to three down, at 26-23, but “Magic Mike”’s most crucial play was holding on to a third and long pass on the sidelines despite a savage hit that came a split second after the ball. That catch moved Davis, a senior, up on NFL draft boards for the toughness under pressure it showed. But this was a gritty football team all night. Redemption came to maligned players like safety Adrian Phillips, who had an interception and made a crucial tackle on 2nd and 1 that led to a punt two plays later, which gave Texas the ball late in the 4th quarter. Still smelling like the doghouse, Joe Bergeron ran it in from the 8 to put Texas up 30-26, their first lead since 10-9. Bergeron came off the bench when Johnathan Gray’s calf muscle puffed and fluttered like Dizzy Gillespie’s cheeks and he was sent to the locker room. Running back Malcolm Brown played hard all game, but was usually met at the line until he sprinted for 27 yards with under a minute in regulation to set up the game-tying FG. Marcus Johnson, whose dreads had almost no camera time in four quarters, came through when it counted most with a third down catch in overtime that turned what would’ve been a 36-yard field goal attempt into a first and goal from the five. UT’s dual use kicker proved to be the greatest Fera from UT since Ms. Fawcett. While Tenacious D was wrapping up their set at Fun Fun Fun, a less funny form of tenacious defense kept Texas in the game early, when the offense was about as creative as the copy writers of those Geico commercials. Led by DE’s Cedric Reed and Jackson Jeffcoat, with Desmond Harrison and the other Malcolm Brown big-assing it in the middle, the Tons of Anarchy had five sacks and forced two fumbles in the first half. They also knocked out the Mountaineers starting QB. A West Virginia tradition is ringing hell’s bells when the opposing team has a third down. That sound was as if from a horror movie in the first half when McCoy and his playmakers seemed clueless. 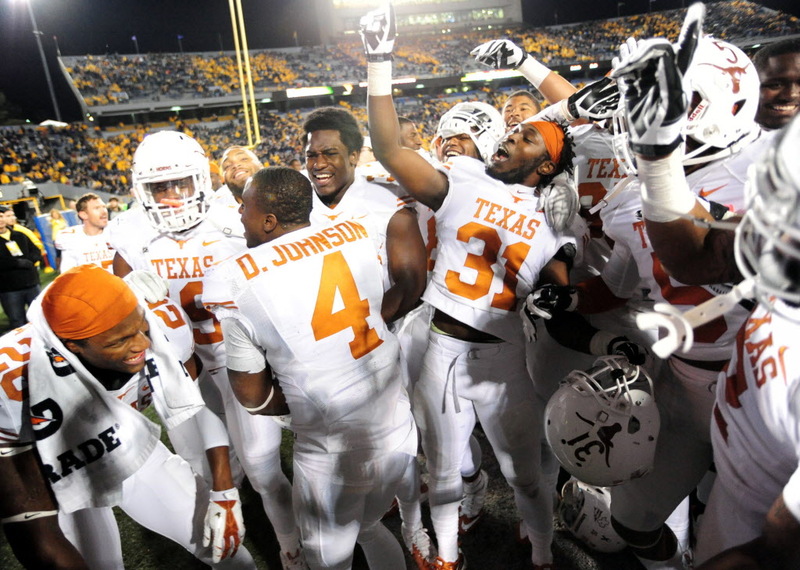 But in the end, the bell tolled for the turnaround Texas Longhorns. It was an amazing, come-from-behind victory on the road from a team that Dolphins walkoff Jonathan Martin was calling soft at the beginning of the season. The number of folks watching the game who would’ve rather been at Fun Fun Fun seeing rapper M.I.A.? Zero. We all had Mack Brown fired the morning after the A-1 Pest Bowl or whatever disappointing destination awaited what looked to be a 6-6 season at best. But he could very well be named the Big 12 Coach of the Year. No one’s faced the kind of adversity as Coach Brown has turned around. Texas closes out the season with challenging games against top conference foes Oklahoma State, Texas Tech and Baylor. But for now the Horns savor. They were in for the fight of their lives last night and came out smiling and bloody. This entry was posted on November 10, 2013 at 2:54 pm	and is filed under Uncategorized. You can follow any responses to this entry through the RSS 2.0 feed. You can leave a response, or trackback from your own site.